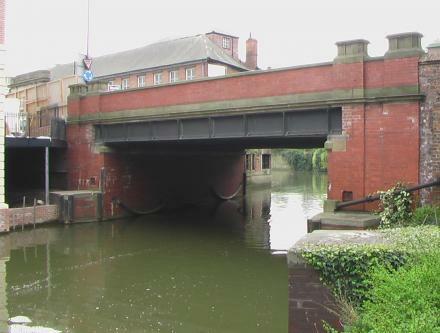 Piccadilly Bridge, York is a minor waterways place minor waterways place place on the waterways major waterways place village town city on the River Foss between Monk Bridge (Upper limit of navigation.) (6½ furlongs to the northeast) and Castle Mills Bridge (1¾ furlongs to the south). The nearest place in the direction of Monk Bridge is Foss Bridge; ¼ furlongs away. Merchantgate, York, YO1 9TU — 47 yards to the east. 12 Coppergate, York, YO1 9NR — 162 yards to the west. 4 Patrick Pool, York, YO1 8BB — 351 yards to the northwest. 1 Church Lane, York, YO1 9QT — 354 yards to the west. 53 Fossgate, York, YO1 9TF — 165 yards to the north. Unit 5, Enterprise Complex, Walmgate, York, YO1 9TT — 165 yards to the east. 11-12A Fossgate, York, YO1 9TA — 182 yards to the north. 11 St Sampsons Square, York, YO1 8RN — 377 yards to the northwest. 28 Castlegate, York, YO1 9 — 159 yards to the west. 2 Piccadilly, York, YO1 9NU — 152 yards to the northwest. 5 Feasegate, York, York, YO1 8SH — 364 yards to the northwest. 4 King Street, York, YO1 9SP — 234 yards to the west. Station Rise, York, YO1 6HT — 761 yards to the west. 6-8 St. Helen's Square, York, YO1 8QP — 537 yards to the northwest. UK, USA, Thailand, Italy, Spain, Argentina, …, York, YO1 — 612 yards to the west. York — 351 yards to the south. Beatrice de Cardi House, 66 Bootham, York, YO30 7BZ — 1134 yards to the northwest. 52 Clarence Street, York, YO31 7EW — 1227 yards to the north. 17-21 Piccadilly, York, YO1 9PB — 67 yards to the southeast. Silver Street, York, YO1 8RY — 283 yards to the northwest. Bootham Crescent, York — 1616 yards to the northwest. York — 1052 yards to the west. 8 St Sampson Square, York, YO1 8RN — 392 yards to the northwest. 14 Goodramgate, York, YO1 7LQ — 621 yards to the north. York, YO — 173 yards to the northwest. Church House, York, YO1 7HH — 607 yards to the northwest. York Museums & Gallery Trust, Museum St, York, YO1 7 — 886 yards to the northwest. 12 Clifford Street, York, YO1 9RD — 237 yards to the west. 31 Fossgate, York, YO1 9TA — 92 yards to the northeast. Trinity Market, Kingston upon Hull, HU12JH — 67 yards to the southeast. Shambles, City Centre, York, YO1 7LZ — 315 yards to the northwest. 12 Walmgate, York, YO1 9 — 52 yards to the northeast. 90 Piccadilly, York, YO1 9NX — 332 yards to the south. York — 1224 yards to the northwest. Blossom Street 5-9, York, YO241 — 903 yards to the west. 14 Lendal, York, YO1 8AA — 630 yards to the northwest. 5 Fossgate, York, YO1 9TA — 203 yards to the north. Ripon — 1233 yards to the northeast. Cumberland Street, York, YO1 9 — 261 yards to the west. Paragon St, York, YO10 4NT — 539 yards to the southeast. Coppergate, York, YO1 9WT — 126 yards to the west. Eye of York, York, YO1 9RY — 209 yards to the south. York — 1301 yards to the west. Leeman Road, York, YO26 4XJ — 1585 yards to the northeast. 1A Low Ousegate, York, YO1 9QU — 323 yards to the west. 1 Tower Street, York, YO1 9WD — 173 yards to the southwest. Tower Street, York, YO1 9SA — 202 yards to the southwest. Leeman Rd, York, YO264 — 1313 yards to the west. York — 273 yards to the north. City, York, YO1 — 313 yards to the northwest.